A FOUR-hour strike was held across the state today as thousands of Department of Education employees ceased work, calling for better conditions and pay. A rally was held on Maryborough St, with several dozen employees turning up to call on the State Government to put forward an offer on a collective bargaining on wage increases. Together Union organiser for the Wide Bay Kayleen Dwyer said rally-goers wanted the government to acknowledge the hard work staff put into the education system. 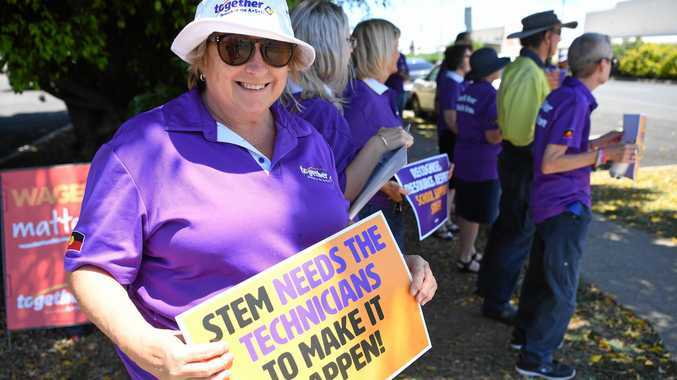 "We have administration officers, therapists, staff that work in a regional office, education officers ... striking because we're going through collective bargaining with their employer, which is the State Government," Ms Dwyer said. "We've seen other government department employees receive a 2.5 per cent wage increase, but these people here have been pretty much offered zero. "That is why these people are calling on the government to come back to the table and continue negotiations and put forward a fair wage offer." Science operations officer Lorrae Goding said Education Queensland employees just wanted to have their voices heard. "We have been doing this for a few months now and the government is not listening to what we need and what we deserve," Ms Goding said. "We aren't recognised for the skills we bring to work ... we just want to be recognised for the assistance we give to teachers."